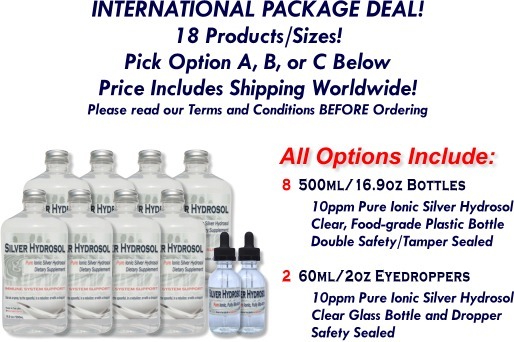 International Package - Our Best Colloidal Silver Hydrosol Products! Sorry, we cannot ship to GERMANY, Customs will return the order. We have shipped many packages to CANADA and the UK without any problems. ALL shipments are sent using the United States Postal Service (USPS) Medium International Flat Rate Priority Mail Shipping Box. The rate is $43 for Canada and $63 to all other countries. www.usps.com This shipping price is included in the product price. Buyer is responsible for any Customs duty. If you live in any other country besides Canada or the UK, you should research your country's laws regarding Colloidal Silver Hydrosol or risk the package being returned. If Customs refuses your order AND the shipment is returned to our location AND the products are in saleable condition, we will refund your purchase MINUS actual shipping costs of $43 to Canada and $63 to all other countries and MINUS a $20 restocking fee. If Customs refuses to allow your order to enter and does not return your shipment to us, we cannot refund your purchase. It is the buyer's responsibility to check local laws before ordering. If your order is lost in transit, we cannot refund your purchase price. An insurance claim with your postal service will need to be filed. We will assist with any problems with the United States Postal Service. We cannot be responsible for damaged shipments. Do not accept a damaged shipment. If you accept a damaged packaged, you will need to work with your postal service for any insurance claims. All shipments are DOUBLE boxed and all products are inspected for integrity before shipment. Cannot be combined with other offers like free bonus products simply because the flat rate shipping box is totally full.